This exercise is a static stretch for the gastrocnemius. 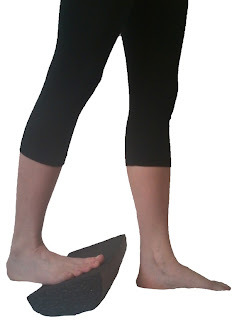 It encourages length in the back of the leg and can be used as part of any hamstring or calf release. It is an excellent exercise to perform after ankle range of motion exercises. To do this exercise you will need a half foam roller. You will place the roller so that the round or rocking part is on the ground. Then place the ball of your foot on the roller and use the roller to reach your heel to the ground. Continue breathing (the deeper the better) and then allow the standing leg (not on the foam roller) to step in front of the roller while maintaining the connection of the opposite heel to the floor. Hold for 30 second to 1 minute. You can increase the stretch by moving the standing foot in front of the foam roller. Breath and slow movements, static stretches can be very useful especially when it comes to releasing fascial restrictions. The breath allows for a calming to continue in the body. It is a great meditative process as well. Continue breathing as your feel the stretch!